A new luxurious government office building has been constructed in the impoverished district of Yingquan in Fuyan City, Anhui Province. Its beauty rivals the U.S. White House and the area of Versailles in France. The construction of this building forced a primary school to be relocated to a decrepit and previously abandoned building. The news of this situation evoked strong local public opinion at the beginning of the year. Recently another school in the district of Yingquan has applied for aid from Japan to reconstruct their school. However, the Japanese media speculates whether Japan should provide lucrative monetary aid in the form of ODA (Official Development Assistance). Japan's Sankei Shimbun newspaper reported on June 20 that the auditor of the ODA case for the reconstruction of Yingquan District's Yangzhuang Primary School doubted the need of the Japanese aid. 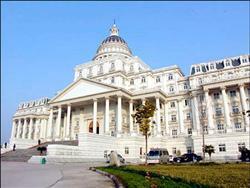 This occurred when he saw the palatial, extravagant government building. The report indicated that Yangzhuang Primary School has not been properly renovated for a very long time. The district government requested assistance from Japan through the Japanese Consulate General in Shanghai. The Japanese Foreign Ministry agreed to send 620,000 Yuan in reconstruction aid. To discuss the details of the application, a Japanese delegate visited the district government. There, they saw the luxurious palace-like government building. Building and material costs for this seven-acre luxurious government residence was around 30,000,000 Yuan (about US $4 million). This was one third of the yearly income in this district. However, the average income for a peasant is less than 1500 Yuan ($200). Sankei Shimbun pointed out that with a flourishing economy, China is competing with developed nations in sending aid to African countries. On the other hand China asks and receives massive amounts of aid or lending from other nations. Japan is considered a major contributor of aid to China. This includes monetary aid without obligations, loans, as well as other forms of assistance like technological partnerships. To date Japan's contributions total 3.44 trillion Japanese Yen (approximately $25 billion).